Shopping is one of my favorite things to do! And discount stores are my favorite places to shop. Home Goods & TJ Maxx are at the top of my list because there is always something new in these stores. But if you see something you like you better grab it quick because it most likely won’t be there the next trip you make to the store. 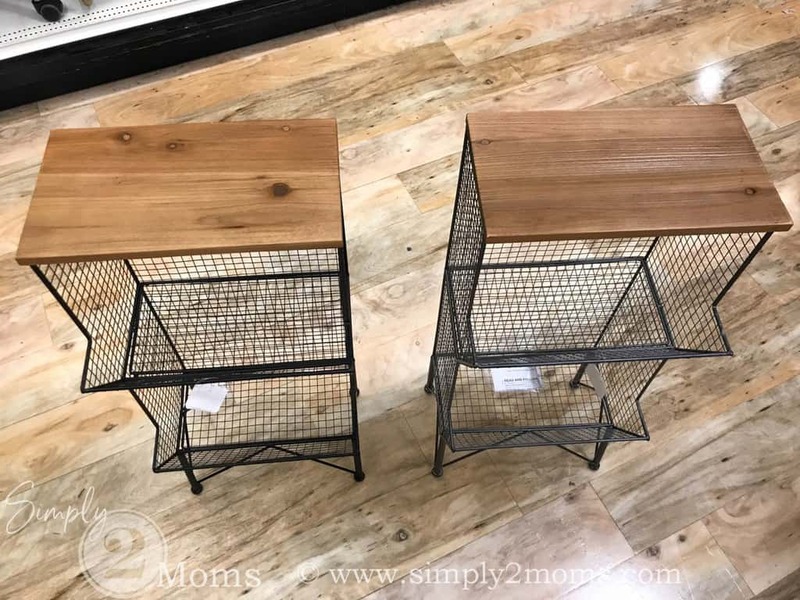 My husband also likes to shop…although he does get bored if we are in Home Goods too long! 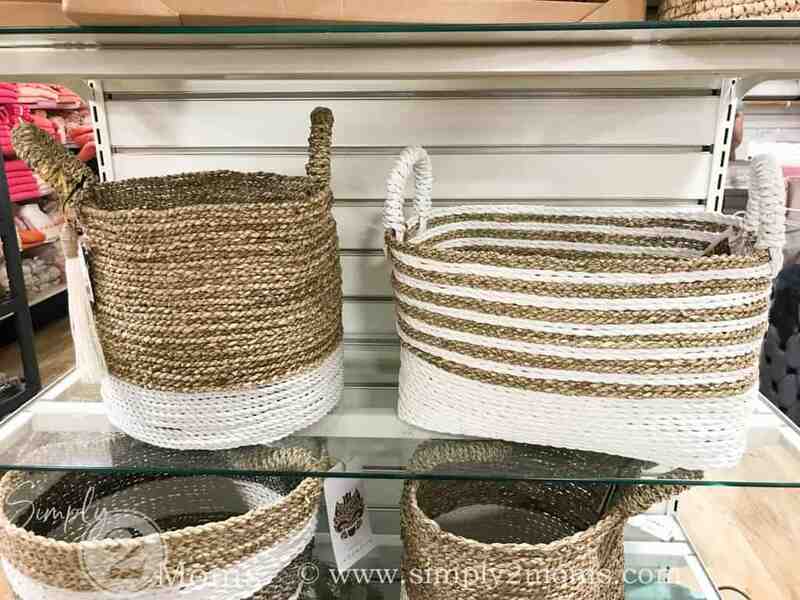 The other day while running errands we stopped in Home Goods/Marshalls to make a return. 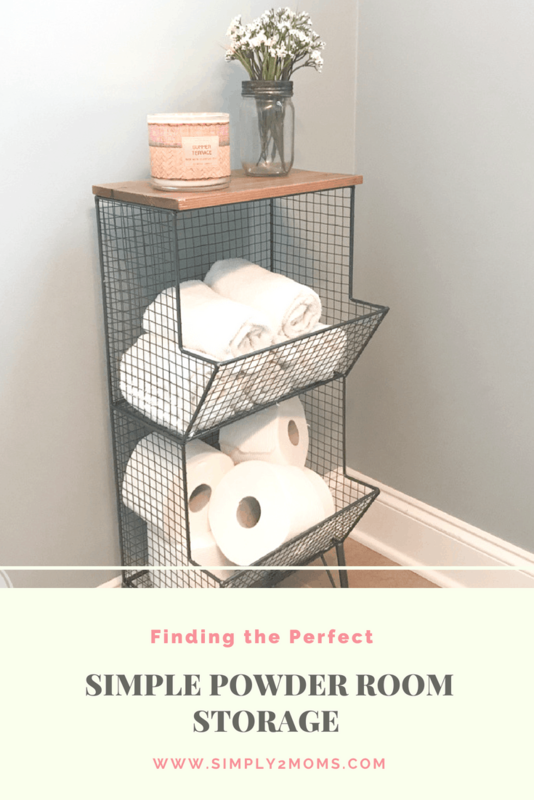 While there I started looking for simple powder room storage. We have a typical powder room downstairs with a pedalstal sink and toliet…which means there is no storage. We used to have a basket on the floor to hold extra rolls of toliet paper. 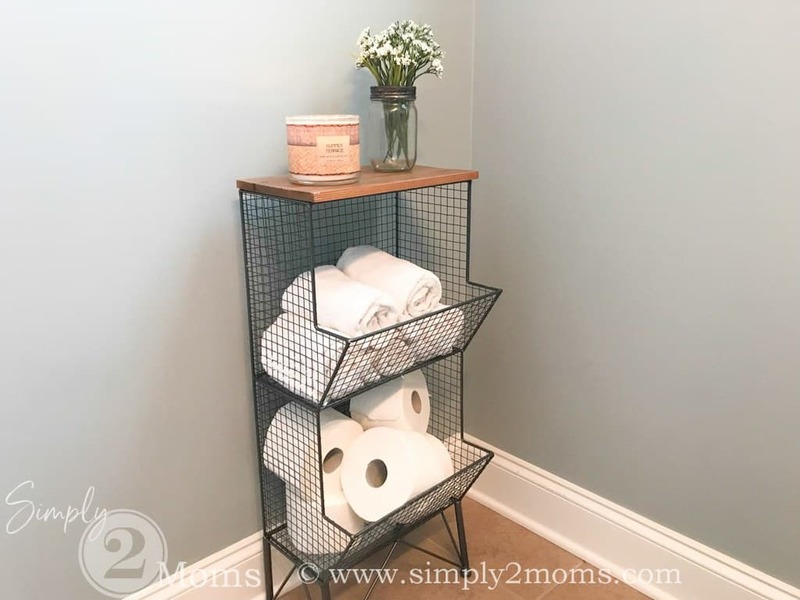 But I was “over it” being in the bathroom and repurposed it one day while looking around the house for a basket to hold all the dog toys. Since then I’ve been storing the extra toliet paper in the hall closet just outside the powder room. But that’s not really convenient if you run out…lol! 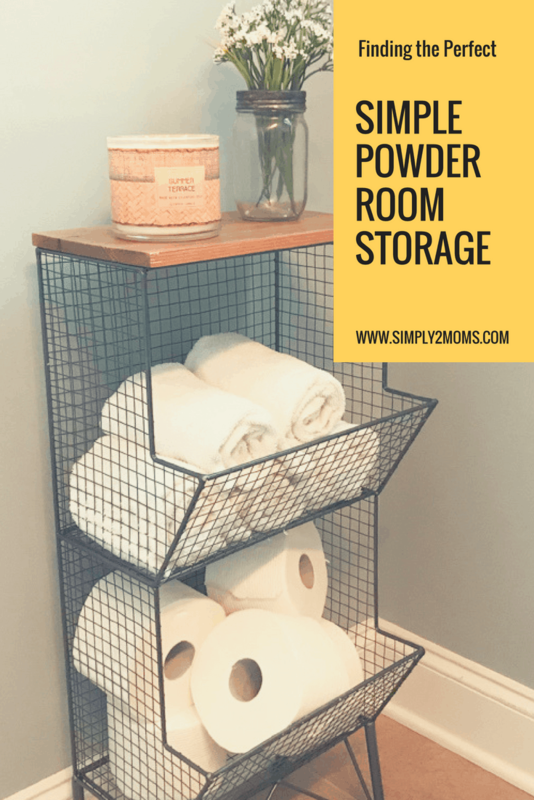 Our powder room is small so there is not room for anything too large. As I browsed around Home Goods I stumbled across a few options that could work. 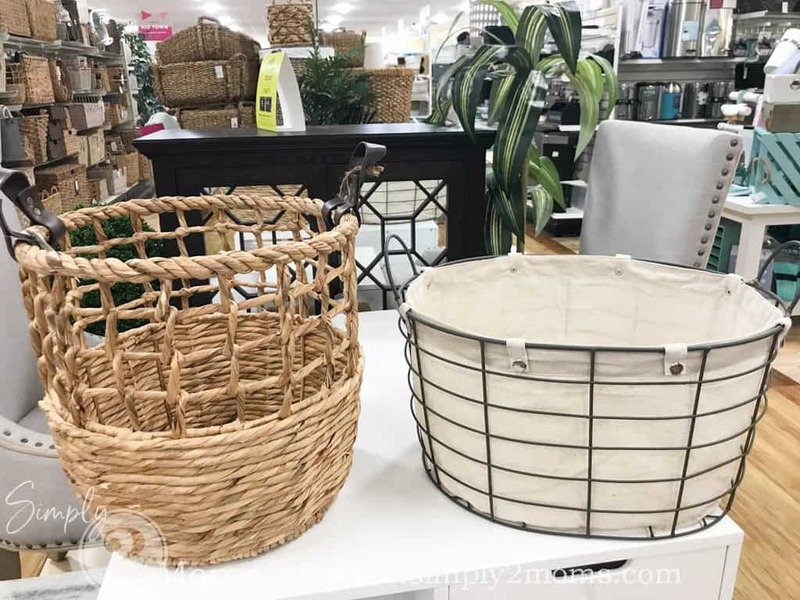 This wicker piece was cute but I’m not sure it would even hold 2 rolls per basket so then it would just look awkward for what I needed it to be used for. 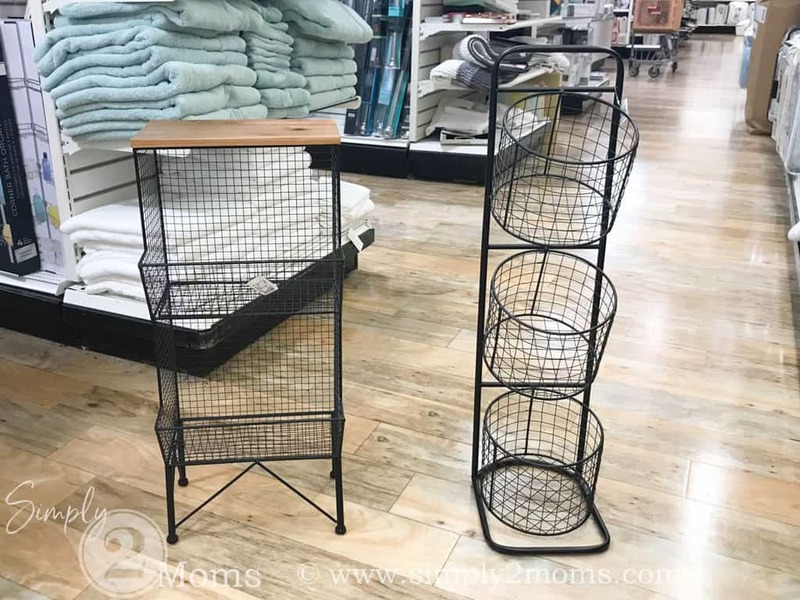 One roll per basket shelf would look odd. The next two were too modern and wouldn’t have been useful in our powder room. 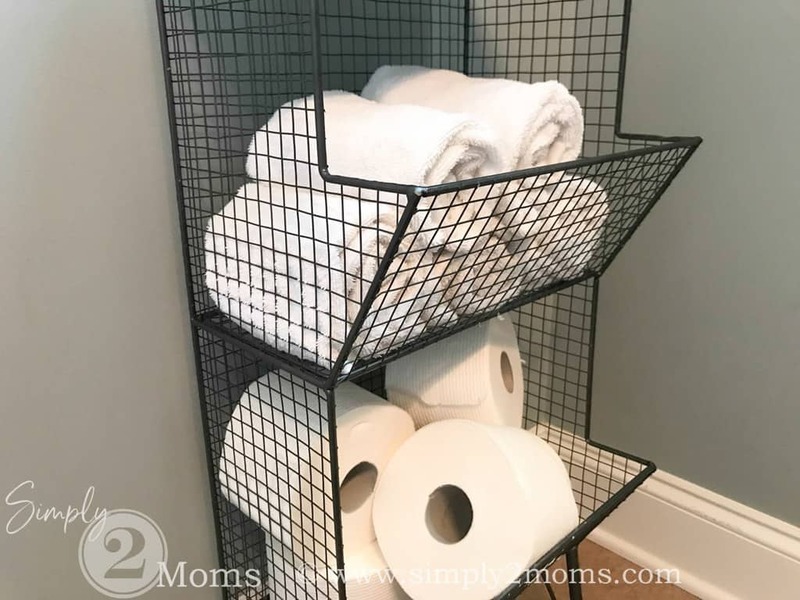 I can see these in a bathroom where you would need extra storage to hold lotions and hair products. Then I walked over to the basket section since a basket had worked in the space before so maybe I could find another one I liked. I did see a few that would be okay but I didn’t love them. And I’ve got to love it to buy it and bring it home! I decided the storage tower with the wood top would be perfect for the space. The basket areas were large and the wood top would allow me to add some decorative accessories. My only hesitation was the color…it was black. Our powder room has silver hardware and a silver framed mirror above the sink. We decided to buy it and just see what it looked like in the room. 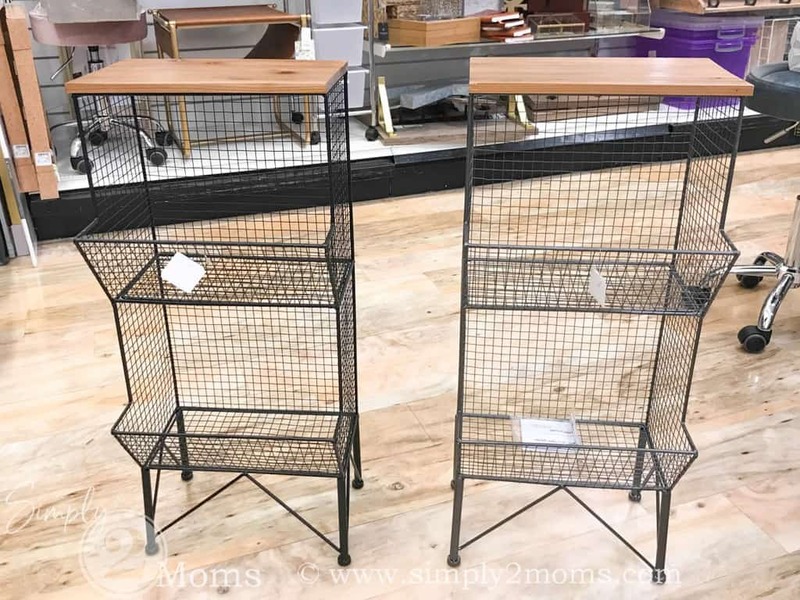 As we were walking out we saw the same storage piece in someone’s cart….AND it was in silver/chrome/pewter…whatever color it was…it was the color I needed. 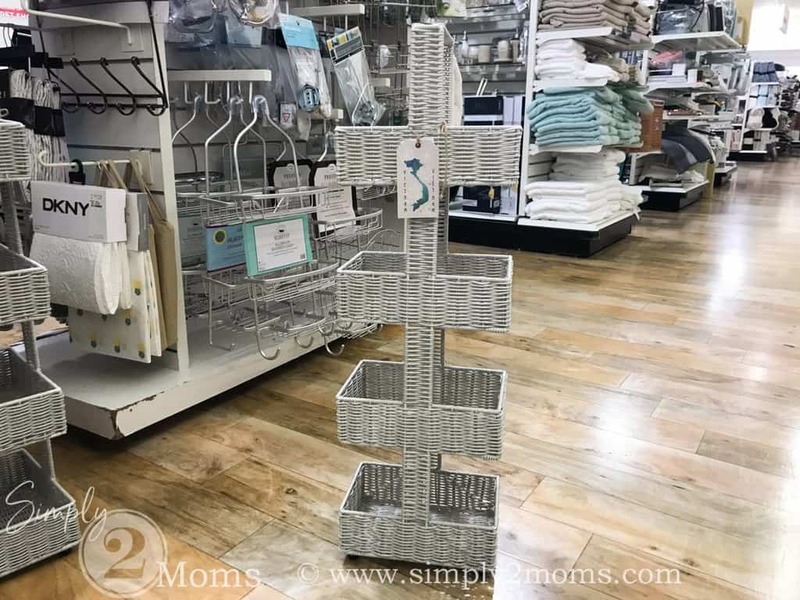 My husband suggested I distract the other shopper and he’d switch our black tower for her silver….he was kidding…kind of! 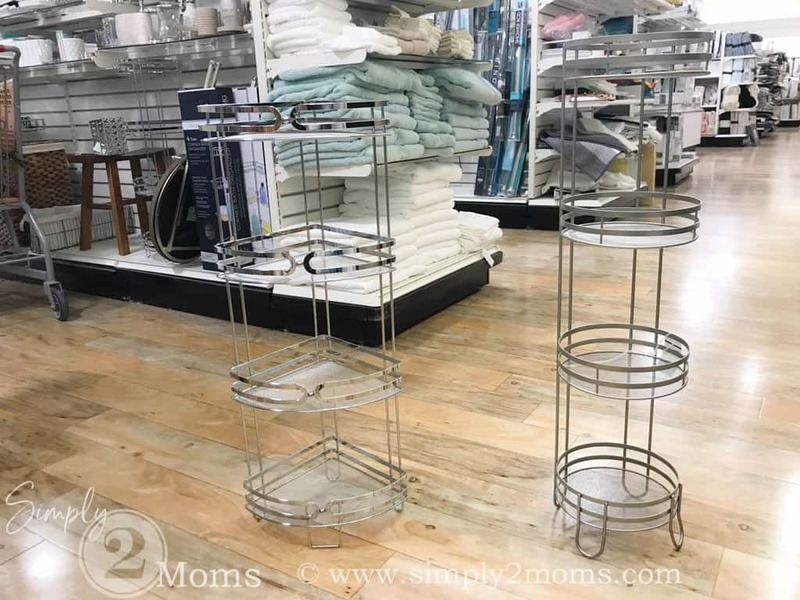 Well I decided we should just go back to the home office section to give one more look around and guess what…we found another silver storage tower sitting right there! The difference is subtle but I LOVED the lighter color. We snagged it and ran to the check out…okay maybe we walked! I couldn’t wait to see if it would work well in our space. I filled the storage shelf with white hand towels and extra rolls of toilet paper. The size of this piece is perfect for the space. It takes no more floor space than the basket that used to sit there. 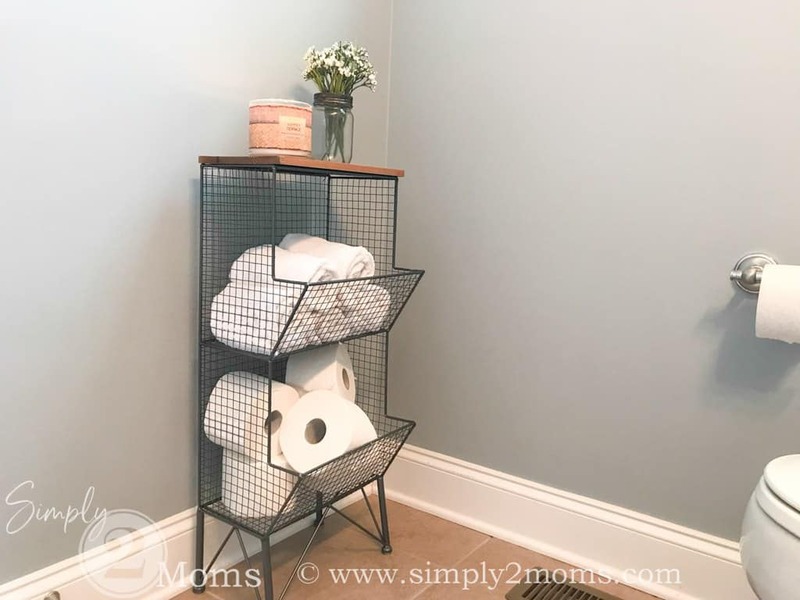 And this storage tower with two baskets hold lots of extra items for our powder room. I can store 5 extra rolls of toilet paper AND 5 clean hand towels! 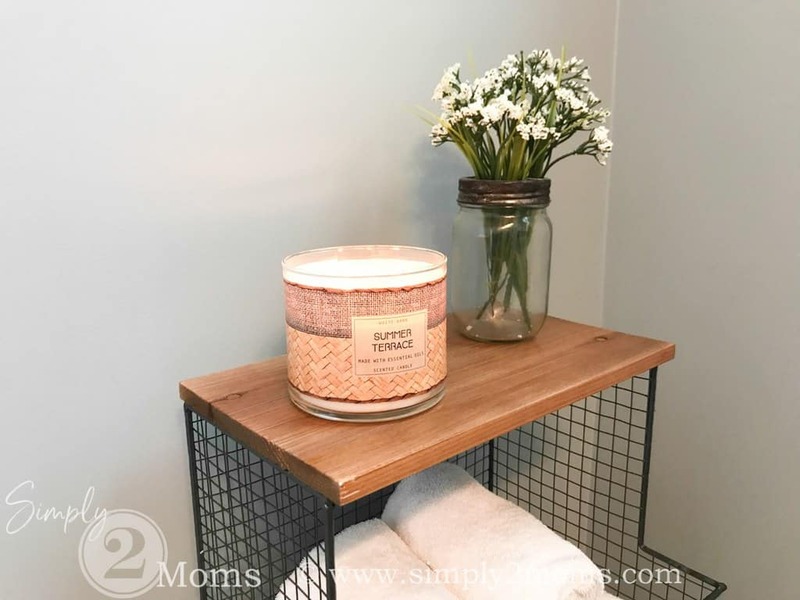 A simple candle and small mason jar of flowers that I had here at home placed on the top of the storage shelf are the perfect addition. I’m a happy girl…it’ doesn’t take much…I’m prettly simple! This piece was $34.99….gotta love a good find at Home Goods! Do you love shopping and finding the perfect item for your home at a great price? Would you like me to share my shopping finds more often? Let me know what you think!